Isn’t it strange how video games can make mundane tasks fun? Take the Harvest Moon franchise for example, as it somehow manages to extract enjoyment out of hard labour. Or Animal Crossing, for that matter, because that franchise managed to farm addicting gameplay out of every day life. Another series that has made something boring enjoyable is Fruit Ninja, Halfbrick’s fast-paced and challenging mobile-turned-Xbox-game. 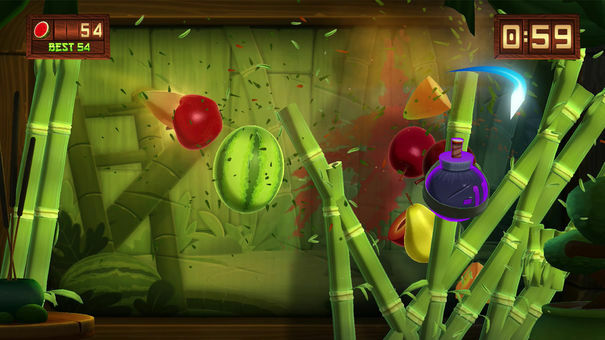 After one successful kick at the proverbial can, it’s returning to Xbox Live as the Xbox One exclusive Fruit Ninja Kinect 2. If you’re like me, then you thoroughly enjoyed the first game and had been hoping that a sequel would see the light of day. After all, not only was Fruit Ninja Kinect a fun experience, but it translated the series’ simple-yet-successful mobile formula over without much fault. Furthermore, it easily ended up being one of Kinect’s best games, though it’s not like it had much competition. 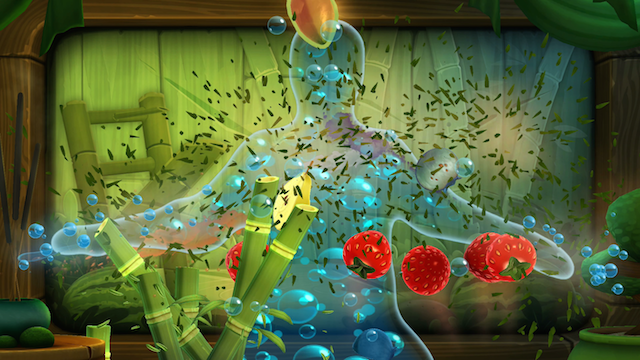 Fruit Ninja Kinect 2 is a lot of the same, though it brings new elements and modes to the fold. What that means is that you can still spend hours flailing your arms about in search of incredibly high scores and leaderboard supremacy in the traditional Arcade, Classic and Zen modes. Those who are looking for something different, however, can opt for the several unlockable Festival mini-games. They’re the closest thing you’ll find to story missions here, and offer a nice change of pace from what we’ve become accustomed to. In order to unlock each of the Festival trials, you’ll have to level up your profile. This is easily done by completing challenges during gameplay. Examples include getting a certain amount of points with limited swipes, or earning three unique combos during one freeze power-up. Some are more advanced than others, but so long as you play the game like it’s supposed to be played, then you’ll have no problem getting to its new content. There are several unique challenges to take on under the Festival banner, including shuriken dodging, spotlight avoidance, target practice and bamboo seed destruction. While the first two are rather straightforward, the others require some explanation. Target practice is something you’ll attempt at the request of a guy who wants to see how good your aim is. And, what you’ll be doing is throwing darts at boards that appear and disappear, in the hopes of sticking a piece of fruit (or two) to each one. It’s a fun diversion, which is made more difficult by the existence of bombs, as they will destroy anything in sight once they’re hit. Conversely, bamboo seed destruction (for lack of a better term) tasks the player with slicing bamboo seeds that fly in from the top of the screen, en route to the bottom where they immediately sprout shoots. Failure to do so means blocked vision and a loss of fruit, and forces you to take a moment to slice away the obstruction before continuing. Like everything else, it’s straightforward but fun. Rounding out this package is a store where earned credits can be spent on unique blades, shadows and backdrops, as well as a multiplayer option. Inside of the multiplayer heading, there are two different competitive modes. The first is a traditional battle with non-traditional elements, including falling fruit, power-ups built for annoying one’s competitor, and tons of splattered juice. It’s perhaps the better of the two, although the four-player Party mode isn’t too bad in its own right, as it mixes fruit slicing with ninja posing and other creative tasks. The upside to Fruit Ninja Kinect 2 is that it’s more of the same, with some cool new modes, whereas the downside is that it’s far from revolutionary. Then again, it’s likely unfair (and rather nitpicky) to criticize a game like this for not thinking outside of the box enough. Still, despite the improvements and new content, this doesn’t feel like a huge step up from the previous game. It’s definitely a better-looking refinement with added variety, but not a completely necessary upgrade. The only real issue that I encountered during my review session pertained to the game’s pause mechanic, which is supposed to activate whenever a player bows his or her head while placing their hands together in a cone or triangle shape. For some reason, I was never able to get it to work, meaning that my only way of quitting a round was by using Kinect voice commands. Even then, I didn’t notice a retry option, unless I somehow missed it. Other than that, the game’s Kinect tracking worked rather well and without any noticeable faults. That’s a definite upgrade, and shows that Microsoft did, in fact, improve things with its second kick at the can. It’s still not enough to make the motion-tracker a must-buy, but it helps. All in all, though, Fruit Ninja Kinect 2 is a very solid and addicting game that is as fun as it is replayable. If you’re a fan of the series, and have some disposable income laying around, then this is definitely worth the purchase. This review is based on the Xbox One game, which we were provided with.